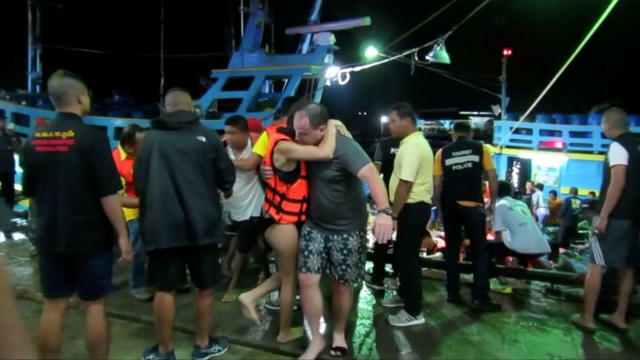 A rescued woman wearing a life jacket hugs a man after a boat capsized off the tourist island of Phuket, Thailand in this still image taken from video. ​Thai navy divers prepared on Friday to search for dozens of mostly Chinese tourists missing after a storm capsized their diving boat off the resort island of Phuket. The commander of Phuket Provincial Police, Teerapol Tipcharoen, said the sea had calmed since Thursday evening’s accident and the search was ongoing. A navy deputy commander, Charoenpol Kumrasri, said they hoped survivors could still be found in the boat, which sits about 98 feet below the surface. He said about 30 navy divers would be sent to take part. Thai authorities said on Friday that the death toll had climbed to 10 and was expected to continue rising. Thailand’s navy said nine bodies of Chinese tourists were being brought to Phuket. Authorities had already confirmed the death of another Chinese man. Navy official Narong Aurabhakdi said some of the bodies were found by divers who entered the wreck on Friday and others were floating in the water. The boat was carrying 105 people, including 93 tourists, 11 crew and one tour guide when it toppled in 16-foot-high seas. 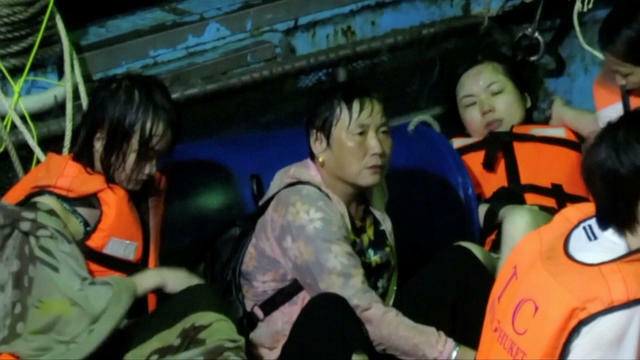 Rescued people sit on a fishing boat after a boat they were travelling in capsized off the tourist island of Phuket, Thailand in this still image taken from video. The incident comes as rescuers, also led by Thai navy divers, struggle to extract 12 boys and their soccer coach from a flooded cave in the country’s far north, where they’ve been trapped since June 23. Phuket Gov. Norraphat Plodthong said on Thursday night that 48 passengers were rescued from the boat, with 49 unaccounted for. Police previously said 90 people had been rescued from the boat and just seven were missing. The reason for the discrepancies was not clear. Thai PBS television reported late Thursday that 12 boats with 263 passengers in all had been forced by the weather to stay docked at Racha island, a popular diving spot about an hour’s boat ride from Phuket. The Thai incidents came after an overloaded boat carrying illegal Indonesian immigrants capsized in bad weather off Malaysia’s southern Johor state late Sunday. The Malaysian coast guard said Friday that 25 people, including a woman, have been rescued. Ten others, including four women, were found dead. Rescue operations involving 150 personnel are ongoing for another nine people believed to be still missing. Such tragedies are not uncommon in Malaysia. Many Indonesians are willing to risk their lives by travelling on boats believed to be old and unsafe to work in Malaysia illegally, or to return to their hometowns.